“If my son had sung to praise President Muhammadu Buhari or Okorocha himself, they could have given him an award. But now that he sang to praise the IPOB leader, (Nnamdi Kanu) he has committed an offence” – Chukwuemeka “Dansach” Okpara. There were few things of pride among Biafrans at the early stages of Biafra’s defeat in the 1967/1970 Biafra/Nigeria war, which helped the people to successfully live through the humiliation and anguish of defeat. Among them was Oriental Brothers Guitar band, which dished out melodious songs for the people. Worthy of note also were Rangers International football Club, which went through many league seasons undefeated; Mike Okpala (Power Mike), world wrestling champion of many years; and the conviction that “Agaracha must come back”. Interestingly, “agaracha must come back” was conviction that no matter how long it took, Odumegwu Ojukwu (the face of Biafra, who was in exile), and Biafra itself, must come back. More on Oriental Brothers music band: The band was so successful back then that even when it broke into three different groups, the people still identified with all the actors because they were individually rare talents that could not be discountenanced with. During their first split, it was Fedinand Chukwuemeka “Dansach” Okpara that took over the leadership. 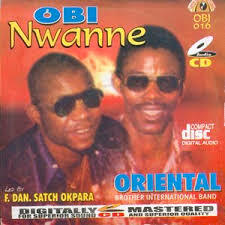 Okpara was in the news recently when Nigerian Police arrested his son, Chidi, for making a song in praise of Biafra and Nnamdi Kanu, the leader of Indigenous People of Biafra (IPOB). Kanu is a prisoner of conscience who has been dumped in Nigeria jail since October last year under trumped-up charges. Since then, Nigerian government has been playing shenanigans, looking for ways to find him guilty. The persecution of Kanu has touched many Biafran hearts that they have been lending support to him. Okpara’s son, Chidi, had to lend his own voice by making music in his honour. That was why Nigerian Police arrested him inside a recording studio at Nekede, near Owerri, Imo State, where he went to put finishing touches to his new album. It was an album he out-rightly dedicated to IPOB and it leader, Kanu. It was because of the arrest of his son that Okpara lambasted the Nigerian Police on their hypocrisy. “If my son had sung to praise President Muhammadu Buhari or Okorocha himself, they could have given him an award. But now that he sang to praise the IPOB leader, he has committed an offence” he said. Okpara did not stop there, instead he continued, showing that no true Biafran will ever talk ill of Biafra or those fighting for its freedom. He declared: “I told those who came to stop my son that in Oriental Brothers Band, we do not sing 419 music and that there was nothing wrong if my son who has taken over from where I stopped decides to sing about Biafra and its leader. 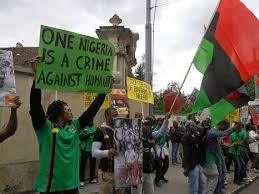 “We all are Biafrans including my son. In fact, during the war, I fought on the Biafra side and I’m still all out for Biafra. Therefore, it is silly for anybody to arrest Chidi for singing about Biafra and Nnamdi Kanu”. He reminded Biafrans and all that cared to listen that Biafra was their heritage, and that nobody would be able to take it away from them. That is how to know true fighters during the Biafra/Nigeria war. They will always rise up to defend Biafra; they will never stand to denigrate a course for which more than four million of their kinsmen died. This was why at Biafra Choice Writers; all rose and raised their fists in salute to Chukwuemeka “Dansach” Okpara and his son, Chidi, for standing strong for Biafra.